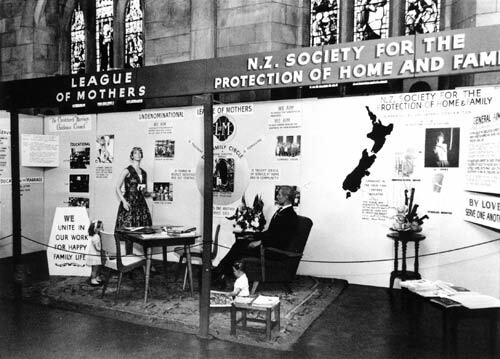 The League of Mothers and the Society for the Protection of Home and Family jointly organised this display in Christchurch for Christian Family Year, 1962–63. The happy family circle, with the mother at its centre, was an ideal that both organisations strove to uphold. The League of Mothers promoted it by providing opportunities for mothers to meet and discuss home-making and child-rearing. I have a League of Mothers coat pin, as on the wall in the above picture, that I have had for many years and I would like to return it to the right place. I live in Rangiora North Canterbury New Zealand. Please advise.